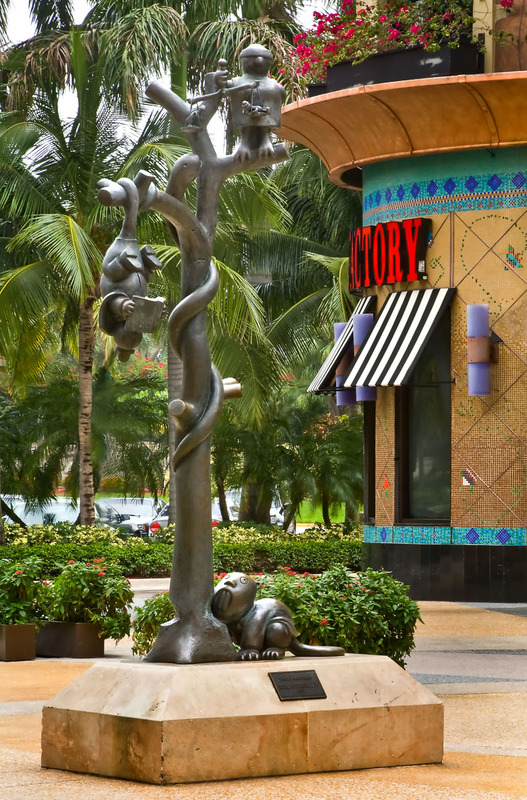 Tom Otterness is one of America's premier public artists. Otterness describes Tree of Knowledge as a "biblical/ judicial mix of story and image." In this sculpture, the serpent of knowledge entwines a bronze tree. The serpent eyes an owl judge, while blind justice weighs two small human figures. A possum engrossed in a law book hangs upside-down, oblivious to the drama surrounding him. At the bottom of the tree, a crafty beaver-lawyer threatens to topple everything. Otterness lives and works in New York. His work is in the collections of the Museum of Modern Art in New York, Carnegie Museum of Art in Pittsburgh, and Israel Museum, among others.